When you’ve got a leak, whether it’s in a tire, a boat, or anywhere else, you’re going to be in trouble if you don’t tend to it. So, if you feel like your money or your time (or both) keep disappearing, it’s a good chance you’ve got some leaks that need checking. 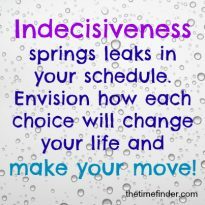 And since time drains may be less visible, we’ll start with finding the leaks in your budget. Then we can swing back and apply the lessons to your time leaks as well. So get comfortable, take a deep breath, and remove your inner critic from this process. That’s a vital first step because this disabling voice distorts reality, and you want to be able to see the whole picture with clarity. Next, do a little detective work to figure out where your money is going. Start by getting everything accounted for. Then you’re in a position to improve your financial outlook with a realistic budget. This exercise is especially important if you are starting to plan for retirement and need to manage a changing income. 1. Calculate all income. The first thing to do is calculate all sources of income for your household. Put together a chart listing income sources and amounts for the past 30 days. This will give you an idea of how much money is coming into your household and is the first step in determining how much money is going out. 2. List your expenses. List all of your regular monthly expenses such as rent or house payments, car payments, credit card and loan payments, gas, food, utilities, cable, internet, and others. Try to list exact numbers, or estimate if your expenses vary. This will give you a good idea of what your basic expenses are. 3. Track every penny. Spend an entire month tracking every cent that you spend. Write down your beginning balance and then every dollar in and every dollar out. This is the key to determining where you’re losing money, and this is where you really need to quiet your inner critic. Just observe and document, don’t judge. 4. Interpret the results. Compare how much money you’re bringing in to how much you’re spending every month on bills and other expenses. Are you spending beyond your means? Allocating money for savings, investments, and retirement? If you have money drains, determine what they are. Are you spending $4.00 on an iced latte Monday through Friday? Are your dining out expenses higher than you expected? 5. Put this information to good use. Armed with your written guide to your income and expenses, you can control your finances more effectively. Once you have this information laid out in front of you, it will allow you to fine-tune your finances little by little until you’re putting more money into savings and less into “money drains” from month to month. Determine ways to reduce these money drains. Can you brew coffee at home to save money every week? Can you cook at home to save money on eating out? A few dollars saved every month in different areas of your budget can definitely add up to your benefit. Once you know how much money you have coming in and going out, you can start directing your money toward what’s really important to you. 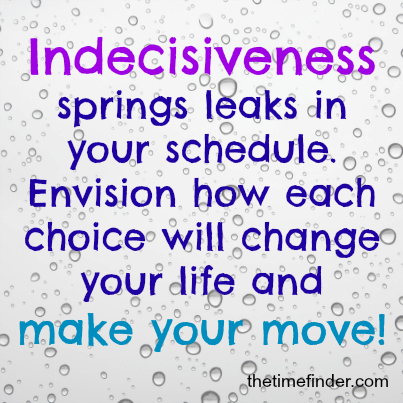 You can use the same general outline to find your time drains. Of course, you don’t need to determine your time ‘income’ since we all have the same 24 hours each and every day. Gaining a thorough and non-judgmental overview of where your time goes enables you to identify your time drains. Then you’re in a position to make conscious choices about them. So observing and documenting how you spend your time each day provides you with a realistic base that you can build from. Conducting this inventory, and doing it periodically to find new time drains, is a time management skill that is vital to your time success. If you’d like help with removing your Inner Critic from this enterprise and from other areas of your life, I invite you to give yourself the extra boost of my Voices Package. The Voices Package includes my popular Exercise and Guide Book titled “These Critical Voices Are Driving Me Crazy!” How to Use Positive Self-Talk to Save Your Sanity and Your Time!